Forrester Research Inc evaluates and rates server hosted virtual desktops. Forrester identified seven contenders in desktop virtualization platform. The following are the outcome of Forrester Research on VDI providers. Remote Desktop Services is a server role consists of several role services. 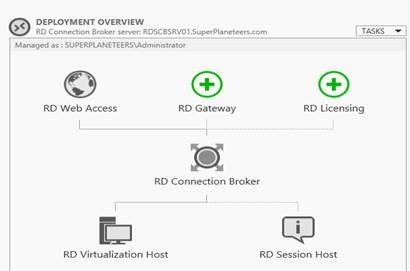 Remote Desktop Services (RDS) accelerates and securely extends desktop and applications to any device and anyplace for remote and roaming worker. Remote Desktop Services provide both a virtual desktop infrastructure (VDI) and session-based desktops. 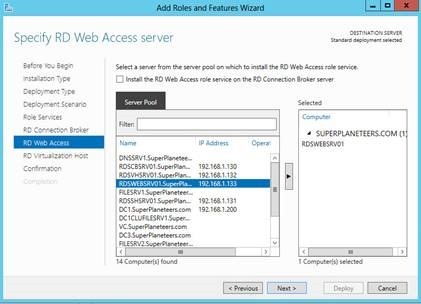 RD Session Host RD Session Host enables a server to host RemoteApp programs or session-based desktops. Enables you to evenly distribute the load among RD Session Host servers in a session collection or pooled virtual desktops in a pooled virtual desktop collection. RemoteApp and session-based desktops Desktop Connection through the Start menu or through a web browser. RemoteApp programs and virtual desktops in a virtual desktop collection. RD Licensing RD Licensing manages the licenses for RD Session Host and VDI. For a RDS lab, you will need following servers. 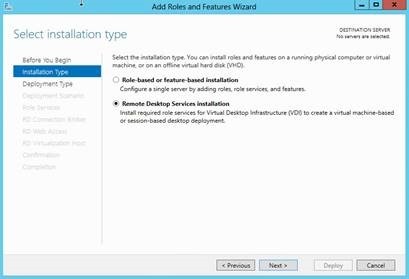 RDSVHSRV01- Remote Desktop Virtualization Host server. Hyper-v Server. 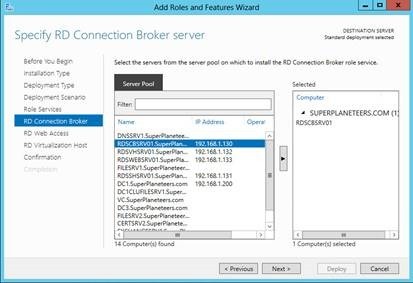 RDSCBSRV01- Remote Desktop Connection Broker server. This test lab consist of 192.168.1.1/24 subnets for internal network and a DHCP Client i.e. Client1 machine using Windows 8 operating system. A test domain called testdomain.com. You need a Shared folder hosted in File Server or SAN to Hyper-v Cluster as Virtualization Host server. 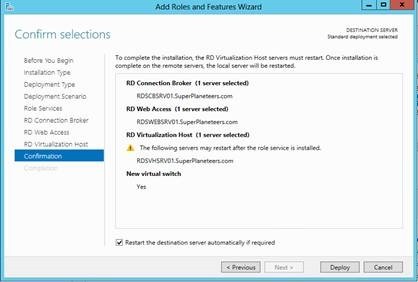 All RD Virtualization Host computer accounts must have granted Read/Write permission to the shared folder. I assume you have a functional domain controller, DNS, DHCP and a Hyper-v cluster. Now you can follow the steps below. 2. Click Active Directory , In the Name (CN): box, type RDS, then click Find Now. 3. Select RDSWEBSRV01, RDSSHSRV01, RDSCDSRV01, RDSVHSRV01 and then click the right arrow. 1. Log on to the Windows server by using the testdomain\Administrator account. 2. Open Server Manager from Taskbar, Click Manage, click Add roles and features. 3. On the Before You Begin page of the Add Roles and Features Wizard, click Next. 4. 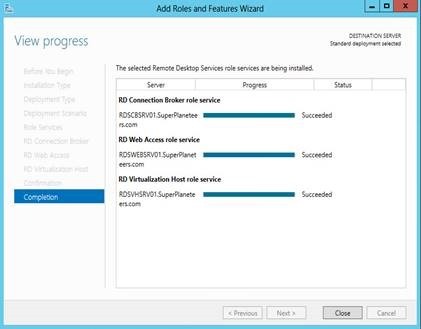 On the Select Installation Type page, click Remote Desktop Services scenario-based Installation, and then click Next. 5. On the Select deployment type page, click Standard deployment, and then click Next. 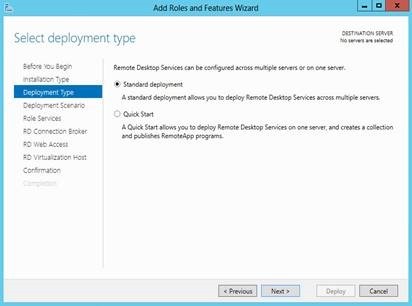 A standard deployment allows you to deploy RDS on multiple servers splitting the roles and features among them. 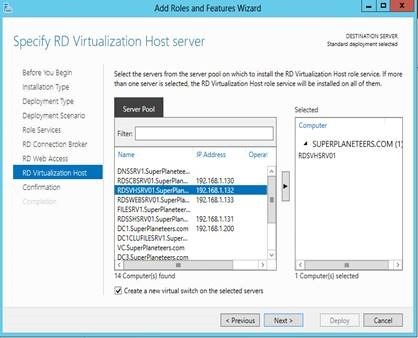 A quick start allows you to deploy RDS on to single servers and publish apps. 6. 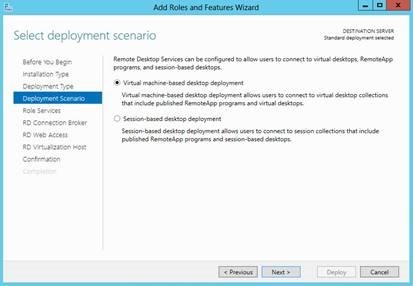 On the Select deployment scenario page, click Virtual Desktop Infrastructure, and then click Next. 7. On the role services page, review roles then click Next. 8. On the Specify RD Connection Broker server page, click RDSCBSRV01.Testdomain.com, click the right arrow, and then click Next. 9. On the Specify RD Web Access server page, click RDSWEBSRV01.Testdomain.com, click the right arrow, and then click Next. 10. On the Specify RD Virtualization Host server page, click RDSVHSRV01.Testdomain.com, click the right arrow, and then click Next. RDSVHSRV01 is a physical machine configured with Hyper-v. 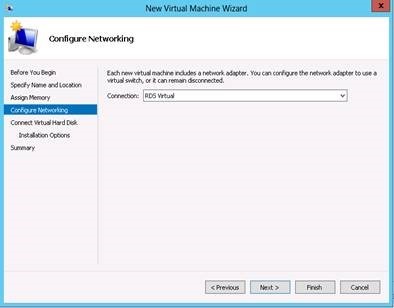 Check Create a New Virtual Switch on the selected server. 11. On the Confirm selections page, Check the Restart the destination server automatically if required check box, and then click Deploy. 12. After the installation is complete, click Close. 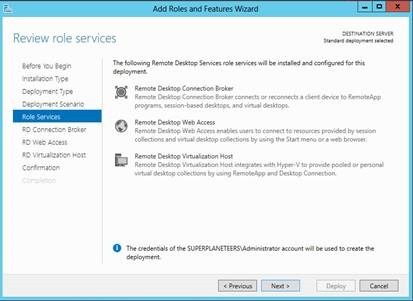 You can ensure that VDI standard deployment deployed successfully by using Server Manager to check the Remote Desktop Services deployment overview. 1. Log on to the DC1 server by using the testdomain\Administrator account. 2. click Server Manager, Click Remote Desktop Services, and then click Overview. 1. 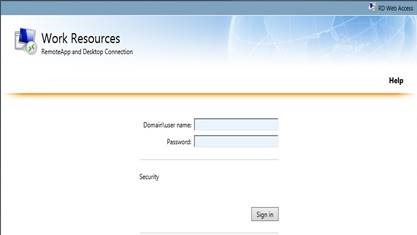 Log on to the FileSRV1 computer by using the TESTDOMAIN\Administrator user account. 3. Click Computer, and then double-click Local Disk (C:). 4. Click Home, click New Folder, type RDSUserProfile and then press ENTER. 5. Right-click the RDSUSERPROFILE folder, and then click Properties. 6. Click Sharing, and then click Advanced Sharing. 7. Select the Share this folder check box. 8. Click Permissions, and then grant Full Control permissions to the Everyone group. 9. Click OK twice, and then click Close. 1. Right-click the RDSUSERPROFILE folder, and then click Properties. 2. Click Security, and then click Edit. 4. Click Object Types, select the Computers check box, and then click OK.
5. In the Enter the object names to select box, type RDSVHSRV01.Testdomain.com, and then click OK.
6. Click RDSVHSRV01, and then select the Allow check box next to Modify. 7. Click OK two times. 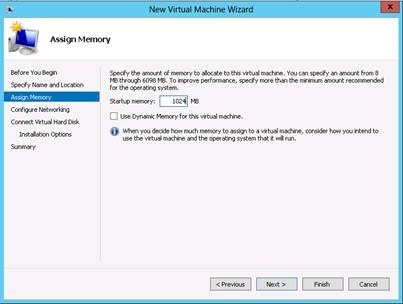 You must add the virtual desktop template to Hyper-V so you can assign it to the pooled virtual desktop collection. 1. Log on to the RDSVHSRV01 computer as a Testdomain\Administrator user account. 2. Click Start, and then click Hyper-V Manager. 3. 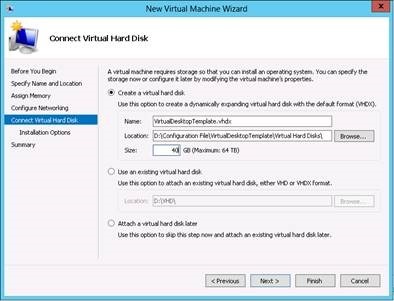 Right-click RDSVHSRV01, point to New, and then click Virtual Machine. 5. On the Specify Name and Location page, in the Name box, type Virtual Desktop Template, and then click Next. 6. On the Assign Memory page, in the Startup memory box, type 1024, and then click Next. 7. On the Configure Networking page, in the Connection box, click RDS Virtual, and then click Next. 8. On the Connect Virtual Hard Disk page, click the Use an existing virtual hard disk option. 9. Click Browse, navigate to the virtual hard disk that should be used as the virtual desktop template, and then click Open. Click Next. 10. On the Summary page, click Finish. 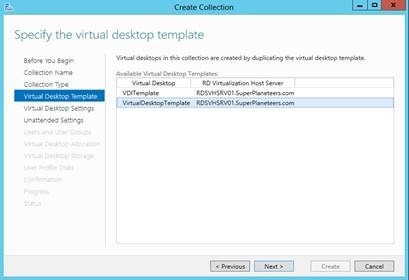 Create the managed pooled virtual desktop collection so that users can connect to desktops in the collection. 1. Log on to the RDSCBSRV01 server as a TESTDOMAIN\Administrator user account. 2. Server Manager will start automatically. If it does not automatically start, click Start, type servermanager.exe, and then click Server Manager. 3. In the left pane, click Remote Desktop Services, and then click Collections. 4. Click Tasks, and then click Create Virtual Desktop Collection. 5. On the Before you begin page, click Next. 6. On the Name the collection page, in the Name box, type Testdomain Managed Pool, and then click Next. 7. 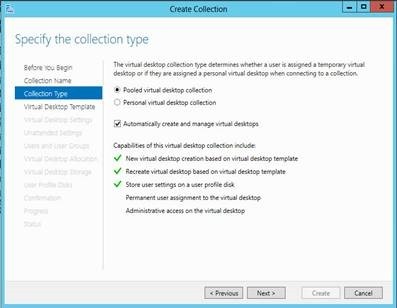 On the Specify the collection type page, click the Pooled virtual desktop collection option, ensure that the Automatically create and manage virtual desktops check box is selected, and then click Next. 8. On the Specify the virtual desktop template page, click Virtual Desktop Template, and then click Next. 10. On the Specify the unattended settings page, enter the following information and retain the default settings for the options that are not specified, and then click Next. § In the Local Administrator account password and Confirm password boxes, type the same strong password. § In the Time zone box, click the time zone that is appropriate for your location. 11. On the Specify users and collection size page, accept the default selections, and then click Next. 12. On the Specify virtual desktop allocation page, accept the default selections, and then click Next. 13. 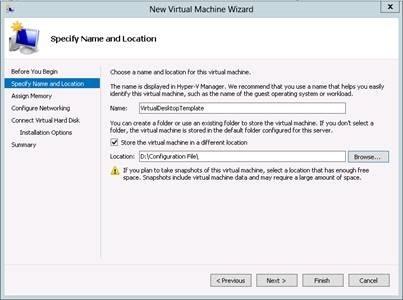 On the Specify virtual desktop storage page, accept the default selections, and then click Next. 14. On the Specify user profile disks page, in the Location user profile disks box, type \\FileSRV01\RDSUserProfile, and then click Next. Make sure that the RD Virtualization Host computer accounts have read and write access to this location. 15. On the Confirm selections page, click Create. 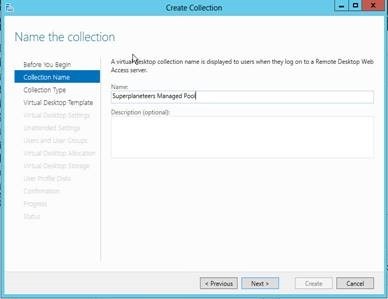 You can ensure the managed pooled virtual desktop collection was created successfully by connecting to the RD Web Access server and then connecting to the virtual desktop in the Testdomain Managed Pool collection. 2. In the Internet Explorer address bar, type https://RDSWEBSRV01.Testdomain.com/RDWeb, and then press ENTER. 3. Click Continue to this website (not recommended). 4. In the Domain\user name box, type TESTDOMAIN\Administrator. 5. In the Password box, type the password for the TESTDOMAIN\Administrator user account, and then click Sign in. 6. Click Testdomain Managed Pool, and then click Connect.